Hyaluronic acid is a naturally occurring substance found in human's skin and subcutaneous tissue. It is responsible for the right skin moisture and firmness as well as for the volume of subcutaneous tissue. 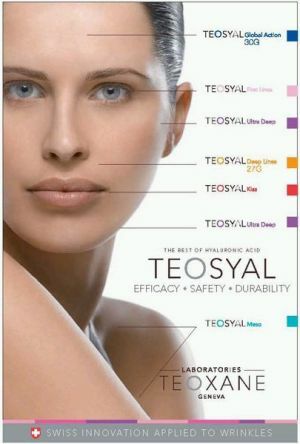 With ageing skin gradually exhausts its natural deposits of hyaluronic acid. The skin loses support, becomes dry and slack, wrinkles and lines appear on the face. The procedure is minimally invasive and the patient is not required to make any special preparations. All the contraindications are excluded during the consultation. Then, together with the doctor, the treatment is planned with respect to which parts of the face will be treated. Depending on the facial area treated, the procedure is done under EMLA cream anaesthesia or dental anaesthesia. The patient can return home right after the procedure, but must refrain from intensive physical activities, bending or severe temperature changes (e.g. sauna) for one day. Usually, normal activities and work can be resumed on the next day. The treatment effects last for about 9-12 months.